Monique Griffith Designs: My First Blog Candy!!!! Wanna win one of my Cricut layout kits? Two people will win one kit each, and you'll have your choice between the "Boo Crew" layout which uses the original Paper Doll Dress Up cart (plus HK font or any font for the title), or you can pick the "Forever Adore" layout which uses the Home Decor cartridge. 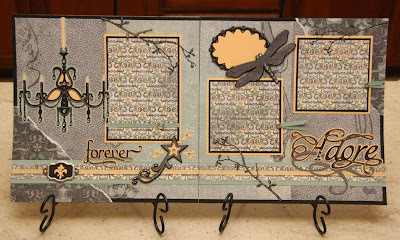 Each kit includes all of the materials you need to complete the project (paper, cardstock, etc) plus detailed directions with color photos and my Cricut Cut Chart which shows you line by line exactly what you need to cut on your machine with all of the settings. Each kit is valued at $25, and I will pay for the shipping within the US (or will pay half shipping if outside of the US). PLUS if I get to 450 followers by Sunday night at midnight, I'll add a third kit as another prize!!! Monday morning, I will draw 2 (or 3) random winners from all entries. So if you comment here AND on the messageboard, you'll double your chances to win, but please submit only one entry per location. And be sure to tell your friends about the giveaway so we can try to hit the 450 mark in time. If you would like a third entry, just post about this giveaway with a link on your blog, and then you can enter a third time (either here or on messageboard), but be sure to mention it in your third entry. What a great give-away. I purchased the Boo-Crew kit and it was fabulous! I am a new cricut user and the directions were very detailed and easy to follow. YAY! I would LOVE to win one of your beautiful kits! They are awesome! And so is the designer! Thanks for the candy :) I love you kits and winning one would just be awesome! Hi Monique- How fun to have your first candy giveaway. Do you know I'm crazy about your work. To win one of your giveaways would be to fun. I enjoyed taking your classes. I am looking forward to coming to another class. By the way if you see the name Elizabeth Kinkel, It will also be Betty Kinkel, (Ronda's sister) same person. Greagt LO's I would love to win. Thanks for the chance. Always love all the details that are in your kids. I would love to win one of these. Hi there. Count me in for my second chance to win. I love the Boo Crew LO. You are so very talented. I'd love to win. Thanks. These are so beautiful, I would love to win, wish I lived near you so I could attend a class. Thank you for the generous give away! I LOOOOOVE your layouts! You put so much detail into them that they look just picture perfect. You are so very talented! Thanks for an additional chance to win. I truly love your creativity. Thank you so much!!! Now I am going to my blog to post a link about your Blog Candy!!!! This is an awesome giveaway! Your pre-made halloween layouts are beautiful! I hope I win! I hope I win! Your cards are beautiful too. You are so talented! Wow Monique, I would love to win Forever Adore for my Sweetheart that passed awaytwo years ago yomorrow on Halloween Day. I LOVE blog candy, and your kits and awesome! I will put a link in my blog too! 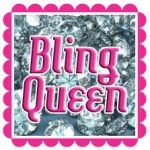 I would LOVE to win one of your fabulous Layouts!!! count me in...I would love for you to drop in my blog...please do! I love a contest and i especially love to win!!! I would love to win one of your layouts! Your work is just super! I love this. I have ordered your kits and I LOVE them. They are so worth the price. Hope I win!!!! Monique, I LOVE your kits. Have finished several. I would love to win!!! What a great give-away! I absolutely love all your layouts and crafts that you show. I always wish I lived closer to you to attend your get-togethers!! I would love to win one! How fun! Both of these kits are amazing!!! I would love to win the BOO CREW kit! Thanks for the opportunity! Thank you so much! These are two of the many layouts of yours that I have been admiring from afar! I just love your blog. It is truly inspiring! What a nice thing for you to do for us..Love Blog Candy! Love your layouts more. And your kits are always the best. I would love to win one of your kits!! They look awesome! Pick me, pick me please. Love your blog and the things you do! I will make it to one of your classes. One day! Wow what an incredible give away!! I would love to be entered. If I win, you can find me on my blog or my email! Thanks, Snowmanlover! Great Give away. Especially since I cant take one of your classes. Your work is beautiful! Ooooo I would love to win one of these! I'm already a follower! Thanks for this awesome chance! WOOHOO!!! I already got the BOO CREW, but sure would love to get the ADORE LO! Thanks for the great blog candy and a chance to win. Halloween is a favorite holiday-we haven't had a party in 8 years and so we thought it was time to have another one. Lots of work, but lots of fun at the same time. HAPPY HALLOWEEN to you! I just LOVE your kits! I would love to win one! Thanks for the chance! I do live close by and would love to join in on one of your classes. HOw can I get some info on your classes? I just LOVE your kits! They are sooo cute! I would love to attend one of your classes. 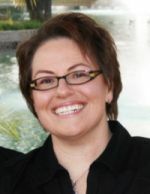 How can I get info on your classes? Wow! Thanks for the chance to win one of these AWESOME kits! Love your work!! You should see the smile on my face =) I would LOVE to win one of your kits!!! I am on my way to the MB now!!! These are awesome! Would love to win one!! I love both of the layouts and would love to win on! Also, I recently asked you for your snoopy cut file and it looks so cute on my layout. Thanks so much! What a nice thing to do! I have always admired your work, and LOVE your kits! Thank you for your hard work and inspiration! 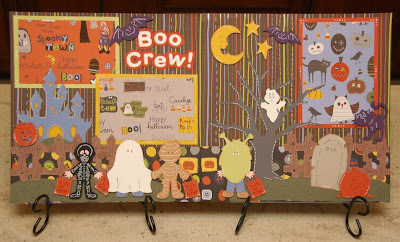 Gosh this would be excellent for my first scrapbooking retreat on 11/13 - I would love to have the Boo-Crew kit! Thanks for the opportunity! Woohoo! I've loved your pages for ages now. I'd love the chance to win one of your amazing kits! Boo-crew looks so cute, I wish I could of taken this class! Love all your other ones, cant wait till my next class!!!! Your LO's are terrific. With each one I see, couldn't choose a favorite. Each one is so very special. If I lived near, I would take every class you gave!!!! Wow! These layouts are gorgeous. What fabulous prizes! I'd love to win one of these kits! If I weren't already a follower, I wouldn't have known about them...lucky me! I'm anxious to get the one that will ship on the 5th. Your work is beautiful! TFS! Your "Boo-Crew" is absolutely adorable!! My daughter had a Boo Bash last weekend and the layout is perfect for the group photos.....I'm hoping I can be a winner!! Thank you for your creativity!! your one talented lady love your layouts. What a wonderful give away and great kits, have purchased in the past and love how fun they are to put together. Thanks so much for great ideas. Well count me in... I love your kits... I hope you draw my name. Ooh! Thanks for a chance to win one of your yummy treats! It just so happens that I missed those 2 classes and would love to have those kits! Pick me! Pick me! Pretty pretty! i need to get the home decor cart now that i see ur layout! Thank you! What an amazing give-away! I love both of these layouts!!!! You are so creative...I would absolutely love to win a kit. My husband's birthday is coming up, so the adore one would be perfect...although I love the Boo-Crew too...hard to decide. I love everything you do!!! Those layouts are so Stinkin' cute! Im VERY new to the Cricut world and I only have carts. I cant wait to get more so I can do stuff like this! I'd just love to win the boo crew pages.....although the forever adore is also a great one. I wish I could attend your classes........but I don't live anywhere near you. Thanks for all of your hard work and for sharing. would love it such cute pages. These are just absolutely adorable. I would love to win either one of these kits, love them both! Thanx for the chance to win and thanx for the inspiration! Oh how fantastic. I just love, love, love your layouts. I've posted to my blog woohoo. Another chance. Your are so generous. I follow your blog faithfully because your ideas are so unique and I love all the detail. My only wish is that you would do more than one a week. (I know they are a lot of work, but I can't get enough of your great ideas.) THanks for all you do and keep it coming. I would love to win and I would love to email you with a few questions about Cricut Classes. I am in Florida...my email is simplyscrappy@comcast.net thanks! Love your blog and your layouts and okay everything you do! Oh my gosh those are all so adorable!!! I love your layouts!!! They are so detailed, I'd love to win one of your kits! How exciting!!! I would LOVE to win a kit!! I never knew of this blog before tonight.. I am now a follower and will be adding this to my blog.. Thanks for sharing!!! These are fabulous, as always! I am a huge fan of your work an I would love to win one of your kits! Thanks for the opportunity! Both kits are just adorable Monique. Count me in!! I don't have either cartridge. It's funny how you look at a cartridge and say "I don't care for it" or "I'll never use that" and then you see a layout using it and now I gotta have it. Thanks so much for sharing such beautiful layouts! Thanks for the chance, I have been thinking of scraplifting your forever adore and I even ran copy off. Would be wonderful to win. Would make it so much easier. The Halloween one is wonderful too. Wow! What a talent! This layout kit is gorgeous! I hope I am the big winner! Love the use of pattern papers. I have such a hard time using pattern paper that it's awesome to see how other people use it. Would love to win this. Hopefully it will inspire me to not be afraid to use more pattern paper in my layouts. Awesome job! Would love to win one of your beautiful kits!!!! Pick me Pick me!!! My daughter was just looking at your Boo Crew layout and she asked me to do one just like that....ya uhhha...I would have to win it....!!! obsessed with you layouts! i wish i could be so creative!!! Love love love them :) so i would be thrilled to have one! Wow! I would love the Boo Crew as I just got the PDDU cart! I purchased your "Wild About You" kit and everyone at my crop loved it!! The directions were wonderful. thanks for doing this. Love your work!!! I would love to win one of your kits!!! Thanks for the chance!!! very cool! THey are beautiful! I am so in for the Boo Crew! I love your paper selections. Always a perfect match. Love you layouts! Thanks for the chance to win one. I love all of your stuff. You are so creative. These layouts are amazing! I would love to win one. The hard part would be to choose! Awesome Layouts..thank you so much for a chance to win one of your kits. Have a great day! Great Give-away. Love the kits, the Boo Crew is too cute. These kits are very cute! !